We instituted the Summer Grants Program to provide an avenue for engaged National Street Service volunteers to continue to do great work in their local communities by building better streets in creative, meaningful, locally relevant ways. Our amazing volunteers have come through on this promise with an inspiring range of projects. Coming fresh from the National Street Service Soul Searching training and community engagement, our volunteers had a chance to further bring their own ambitious ideas to life. Each project, in its own unique way, altered the tangible experience of the street, and invited members of the community to comprehend the possibilities of how much better streets can be. Brian stands with the eight signs he created with the assistance of Public Workshop. 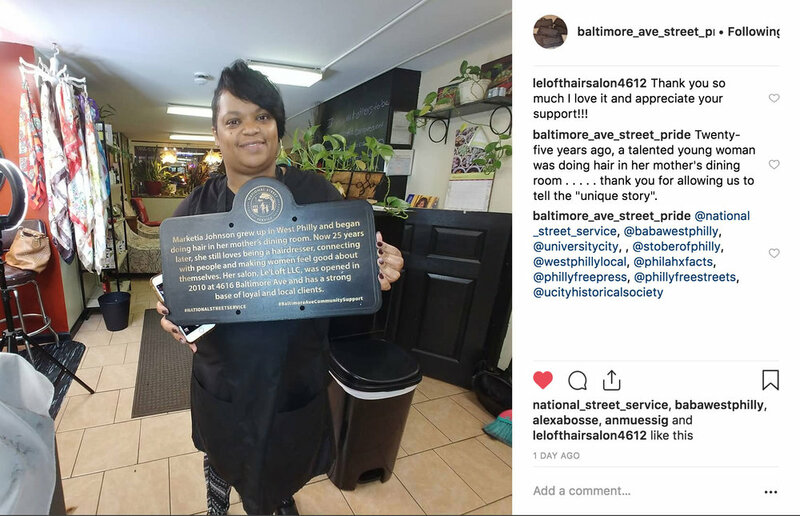 Each sign shares a inspiring piece of local history, documenting a business which has grown from humble beginnings to become a fixture of the local community on Baltimore Avenue. When the Summer Grants Program was announced, Brian jumped at the opportunity to continue the work he began during his time with the National Street Service. In a historic city, already dotted with historic markers, Brian created and hung three historic markers to honor the recent local history of his neighborhood street. His signs catalogued inspirational tales of businesses who, from humble beginnings, got their start to become fixtures of their local communities. With help from the Summer Grants fund, and production support from Public Workshop, Brian created eight more signs, each sharing the story of a local business. A local business owner expresses their appreciation for the sign which Brian created to celebrate their story. Deborah shares the story of how she organized the murals, in front of a freshly completed mural by local artist Anne Moore. Deborah graduated from the National Street Service program with an ambitious project in mind – to make her neighborhood more livable and more connected as a community, by making improvements to a street which has long been a source of tension between local business owners and people who live in the neighborhood. 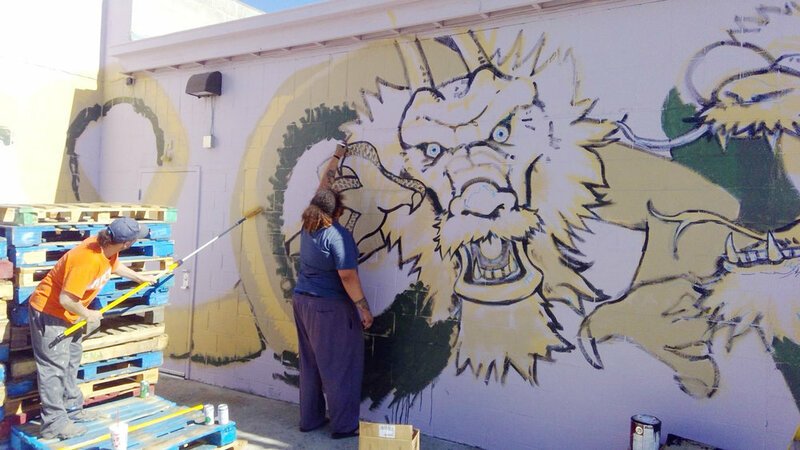 The street was beautified with the addition of five murals, with the help of five local artists. Four from the Treasure Valley Artists Alliance contributed under the lead of Jesse Bateman, and one local artist from the neighborhood, Anne Moore. The result is the transformation of an uninviting alleyway into a space with more life. Artists collaborate on a new mural, under the lead of Jesse Bateman, adding life and vibrancy to a street in Boise’s Central Rim neighborhood. Residents of San Antonio, TX discuss the future of a busy downtown street which will receive major improvements over the next few years at a parklet organized by Participation Studio and Centro San Antonio. Nicolas, owner of Participation Studio TX, and the city lead from our San Antonio pilot was brimming with creative ideas to build support for better streets in his home state of Texas. When he came to us seeking a grant to use his ice cream truck / mobile office / sleeper van to conduct a Street Soul Tour, we were excited to see what he would do to bring the National Street Service to even more places. While the initial idea was to connect two of the pilot cities, San Antonio and Philadelphia, things did not exactly go to plan. Following this hiccup, with a repaired van ready and waiting, Nicolas embarked on an amended itinerary which brought him to four cities. Tackling so many cities in a short space of time was a bold choice, and revealed a lot of insights of interest when learning how to engage in new cities. All of these events reflect well on the National Street Service’s values of experimentation and community engagement, and there is much to be learned from this tour – both from where it succeeded, and what could be improved the next time around. Residents of Marilla, TX highlight accessibility issues along a stretch of sidewalk between a popular farmer’s market and public library, in a walking tour organized by BC workshop for AARP. The City of Dallas is considering pedestrianizing this passage to encourage foot traffic. From the Boise National Street Service training, a team of freshly minted street rangers continued pushing toward their shared purpose of making Boise’s streets into neighborhood ‘places’. The team identified two strip mall parking lots which had the potential to be re-imagined as community gathering places. 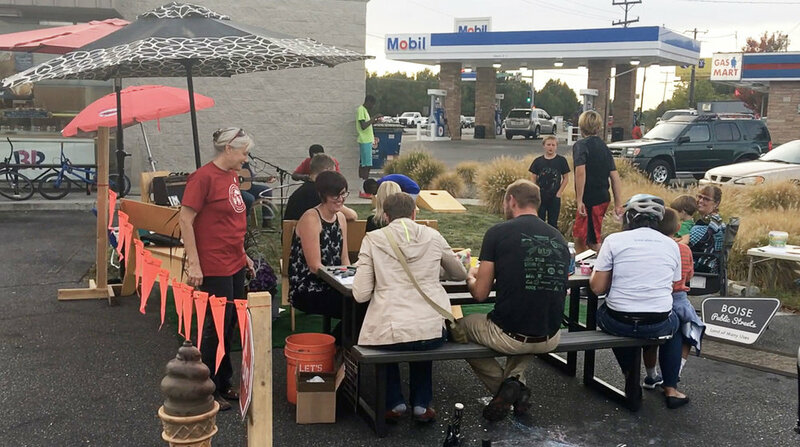 As part of a broader set of parklets created for PARK(ing) day in Boise (coordinated by Idaho Smart Growth), the National Street Service grant assisted the team to set up parklets within the two strip malls which opened up the parking lot to people. The parklets featured a range of fun activities and attractions, including live musicians, hula hoops, pet rock painting, corn hole and a giant chess set. Each parklet drew a crowd of curious neighbors of all ages. The aim of these efforts is to demonstrate that changing the way that parking is used on busy streets can make Boise’s streets more appealing places for people to linger and enjoy, which is of benefit to local businesses. Residents of Boise’s Collister Neighborhood enjoy the parklet’s activities, games and music. Flyer for the event organized by the National Street Service Youth Team. The Community Listening Box, which collected messages of hope from across the community. Some of the notes collected were shared at a street exhibition to invite further community feedback and discussion. During the ten week training program, the team designed and implemented their own ideas, creating a Dream Wall, which connected people of all generations to share their childhood hopes and dreams. They also created a Community Listening Box as an outlet for members of their community to share their hopes for the future.